A major new candidate is in the race to replace Rahm Emanuel as mayor of Chicago. Cook County Board President Toni Preckwinkle officially jumped in the race Thursday, but her announcement comes amid controversy over the conduct of one of her top staff members. Preckwinkle gathered with dozens of supporters in a hotel conference room off Lake Shore Drive in the Hyde Park neighborhood. It was a hot, chaotic and packed affair, as the County Board president and former 19-year veteran of City Council told the crowd that she was “uniquely qualified for this moment.” She laid out her accomplishments and painted a broad picture of where her priorities would be as mayor. Meanwhile, Preckwinkle sought to deflate the controversy surrounding her former chief of staff John Keller, who was asked to resign on Tuesday. Preckwinkle’s office had initially announced that Keller left for personal reasons, but Preckwinkle later clarified that it was because of credible allegations of inappropriate personal conduct, hinting strongly at sexual harassment. Preckwinkle maintained that she acted as soon as she knew. “The allegations was brought to me on Friday,” Preckwinkle said. “On Monday and Tuesday, we corroborated the allegation by talking to the victim and two witnesses, and we demanded his resignation. I have zero tolerance of this.” She added that she had not been aware of any previous allegations against Keller. On the issues, Preckwinkle said she supports sanctuary city policies and is in favor of the police consent decree but not necessarily in favor of hiring more police officers. On education, she stated clearly that she wants an elected school board, and she is opposed to closing any more public schools. She also scored a big endorsement Thursday from Valerie Jarrett, a top advisor to former President Barack Obama, as well as from the public employee union SEIU. The general consensus in political circles is that Preckwinkle, if not the front-runner, is in the top tier of candidates because of her record and name recognition. But other council members are more skeptical of her political style. “Listening to some of my colleagues in the county, she does run that chamber with an iron fist, so it’d be interesting to see how it is coming back over here,” said 36th Ward Ald. Gilbert Villegas, chairman of City Council’s Latino Caucus. 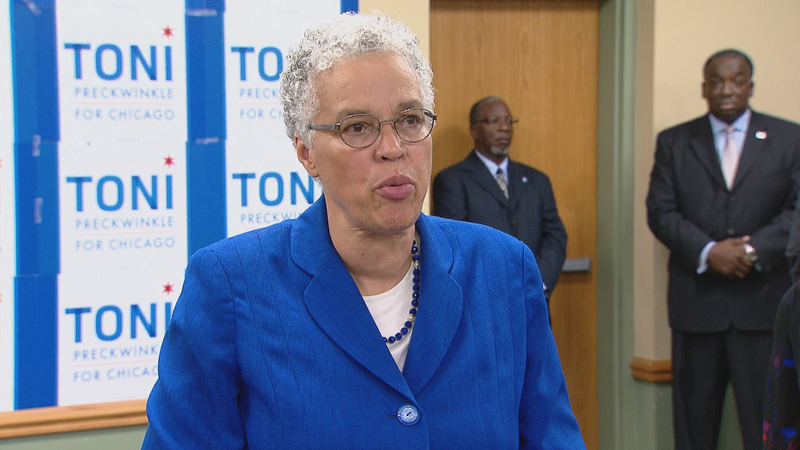 Preckwinkle is a candidate running unopposed for another term as Cook County Board chairman. That election is in November; the mayoral election is in February. Fellow mayoral candidate Paul Vallas took the opportunity to criticize her for running for two offices at once. And Preckwinkle’s longtime ally, Cook County Commissioner Jesus “Chuy” Garcia, is expected to get in the race for mayor in the coming weeks. Garcia received a nudging on Twitter from his friend, U.S. Sen. Bernie Sanders, a former presidential candidate.